The Virtuous team has been busy for the last several weeks cooking up some new tricks that should provide you with a few good treats! So before you make any last-minute tweaks to your costume, or do some quality-control candy sampling, read on to see what the latest release has in store for you. When our users talk, we listen! We’ve been hard at work addressing some feedback from our users to improve the gift entry process in Virtuous. You’ll see a few of these features in the latest release, which should make things move a little more smoothly. Right off the bat, you’ll see that we’ve implemented an instant search when manually entering Contact data for a Gift. Once you see the correct match, selecting a record will now highlight the selected record on-screen. For those users matching Gifts to Pledges, we’ve refined our matching logic. In the past, Gifts that were matched to Pledge Payments without an exact date match were sorted into the Needs Updates category, with a matching Pledge Payment pre-selected but needing approval before moving forward. We’ve heard from several users that approving these matches takes too much time, especially since the pre-selected matches are frequently valid. To help, we will now sort these transactions as Ready to Import, removing the need to individually validate matches. Users who would like to review these matches in the Ready to Import section can look for a new icon, which indicates Gifts that have been matched to Pledge Payments without an exact date match. Ever wanted to connect two people via the Relationships feature, only to find that the available Relationship Types are missing the one value you want? Well, worry no more! Now, admin users can use the Data Customization tab in the Settings menu to create new, custom Relationship Types, complete with custom groups and custom defined Reciprocal Relationships as well. We’ve also addressed a bug that prevented users from linking two Individuals via Relationships, so you have several new options for managing Relationships. Now, you can combine the power of Virtuous Automation with all of the features built into Organization Groups. We’ve added a new “Organization Group” action to Workflows, allowing the option to assign or unassign Contacts to or from a specific Organization Group. 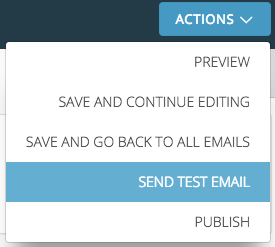 For users with access to Virtuous Marketing, including Virtuous Email, you now have the option to send a test email to yourself (or a colleague) when working in the email editor. Just click on the Actions drop-down in the upper right. And speaking of email, you can now opt to include Contact Custom Fields as merge fields in any new email. 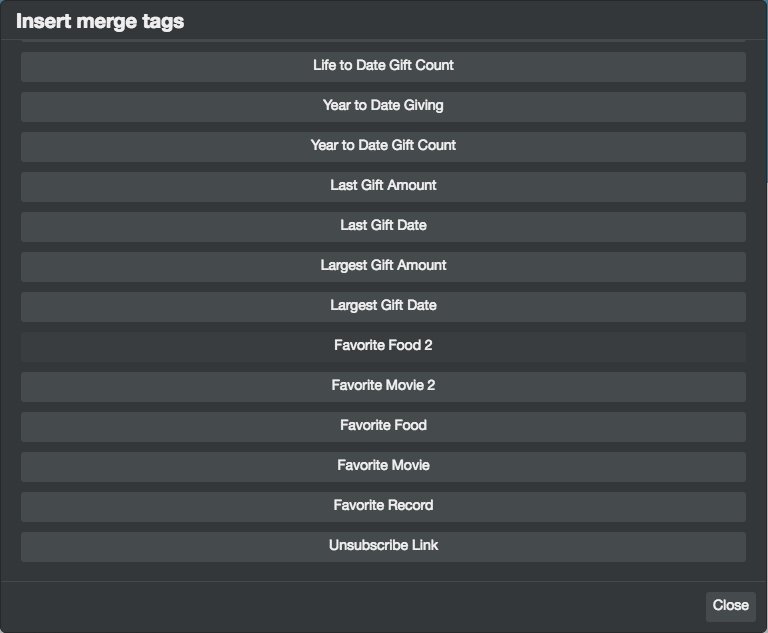 When editing a text object, just select “Merge tags” from the edit menu. As part of our continued effort to improve our training and support offerings, we’ve given our help pages a bit of a facelift. Click on the mortarboard hat in the upper right to check out our new look! And as with every release, there are a number of other tweaks, fixes, and enhancements, including some additional query export fields, some new API interactions, and more. So put down your pumpkin scone, come on in, and see what’s waiting for you in the newest version of Virtuous. As always, if you have any questions, feel free to contact us via email (support@virtuoussoftware.zendesk.com) or use the Help widget in Virtuous to submit a support request.